What were the celebrity tats that got us talking in 2017? Let us know whose tattoos are your faves in the comments! We still can't get over it, but we think Justin was a badass to survive a full session of needles poking his skin. 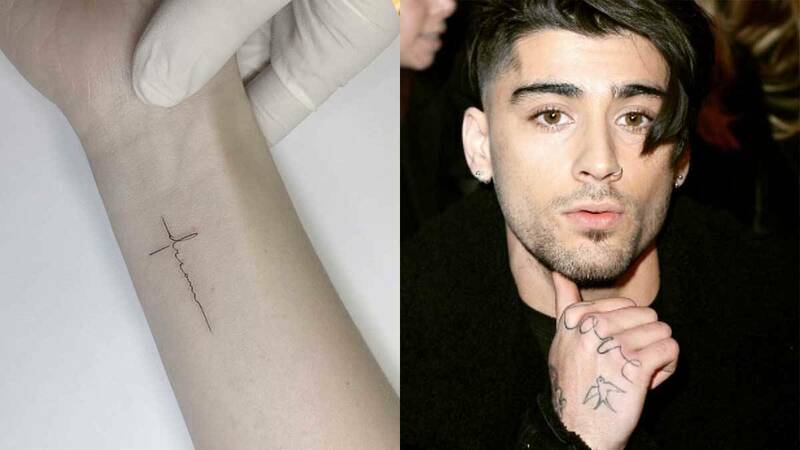 When Zayn got a "love" tattoo on his knuckles, people thought it was for his GF, Gigi Hadid. On the other hand (pun intended), Gigi was spotted wearing a simple gold band on her ring finger. These two occasions had everyone speculating back in January 2017 that they were about to tie the knot soon—well, the year's about to end in a few days, so it's safe to assume these were all rumors! Sel got the semi-colon symbol inked on her arm. 13 Reasons Why stars Tommy Dorfman and Alisha Boe were with her and got the same tattoo. Dorfman explained the meaning of the tattoo in his IG post: "The ; symbol stands for an end of one thought and a beginning of another. Instead of a period, authors use the semicolon to continue a sentence. For us, it means a beginning of another chapter in life, in lieu of ending your life. I struggled with addiction and depression issues through high school and early college. I reached out and asked for help. At the time, I thought my life was over, I thought I'd never live past the age of 21. Today I'm grateful to be alive, in this new chapter of life in recovery, standing with my colleagues and friends, making art that helps other people." Pretty Little Liars star Lucy Hale got a flashing lightbulb tattooed above her left elbow by Hollywood artist Dr. Woo. We think it's a cool tatt that reminds us our minds are always filled with great ideas. Also falling under elbow tattoos is Bella's tiny rose on her left tricep. It was done by NY-based artist Jonathan "JonBoy" Valena of Bang Bang Studios. We think it suits her ultra-femme personality. Just like Bella, Angelica also got a flower inked on her body. She had artist Boots Brandon of Redeemed Tattoo in Cebu City place a lily of the valley tattoo on her right wrist. And it doesn't stop there: Angelica also got the letter "a" and her birthdate inked on her left wrist and right ankle, respectively. When Tyga was still Kylie's flame, she had the letter "t" inked on her ankle. But after they broke up, she got it transformed into "la," which most likely stands for Los Angeles, the city where she grew up. To cap off this list is Anne Curtis' dainty ink by an artist from the IG-famous, Seoul-based studio, Playground Tattoo. The word "dream" was written in cursive and placed in the shape of a cross. Erwan Heussaff, her then-fiancé, got a palm tree ink from the same artist.